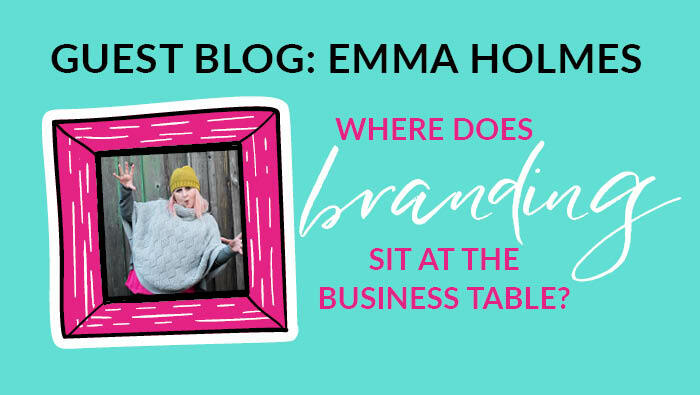 Where does branding sit at the business table? I’ve asked myself this several times especially around my own branding. I bloomin love my brand! Yup, this article is sitting here on Vicki Nicolson’s website and it’s totally her magic that has supported the visual development of #brandrockstars. When I started to work with Vicki I was the proud owner of a logo and some brand guidelines ~ all you ever need when it comes to branding apparently! It had taken me a little bit of time to align the confidence to be more than just that logo and during the last 18 months we have developed and tweaked the brand to the place we are today. The brand is absolutely a focal point and an identity within the business. It allows consistency and it allows people to recognise my work at a glance because it’s aesthetic properties. The thing is that the brand is important BUT it’s equally as important that you make the best of your brand. Your brand isn’t there to hide behind. Your brand isn’t there to be an “instead of” showing up. You can have the most beautiful brand in the world but still be vanilla if you’re not prepared to be part of it. I mean check out my brand – it’s full of life, movement, personality – and it’s engaging and vibrant – it captivates. VANILLA, BEIGE WHATEVER YOU WANT TO CALL IT, IT IS TIME TO STOP BEING BORING. Stop hiding behind your computer or hiding behind your branding. I know it’s kinda like holding a cushion over your face during a scary movie, somehow it feels super safe BUT safe isn’t always the best option! They are stacks of business out there which I know (for certain) are run by amazing, strong women who are brimming full of personality but what they are doing in their business is just plain boring. The messages that they put out there are NOT inspiring, rallying or in any way reflecting the passion and drive they have for their business or their products & services. THEY ARE SELLING THEMSELVES SHORT. THEY ARE BEING SAME OLD, SAME OLD. They are blending into the background at best. And at worst they are just repelling people in the opposite direction. It is tragic, they could be helping so many more people if they just allowed who they are & what they do to shine through. It is so true that people buy from people. If people make a connection with you, form a relationship with you, grow to like you then they are going to trust you. They will trust what you say, they will see you as an expert, an authority if you will & they will feel more safe & secure in buying from you. That, of course, is the ultimate aim of your marketing. So it all boils down to the “know, like & trust” factor. People wanna get to know you, form that relationship, start to like you and then they will trust you. Hiding away behind your brand or your computer, adding no personality to anything you do and not letting your audience know a little bit about you will result in less sales. Don’t be afraid to come out from behind the branding, your ideal customer will LOVE you, LOVE the way that you are authentic and real with them and LOVE getting to know you and becoming a customer. So now is the time, strip off those vanilla shackles, stop being boring and let your audience get to know you a bit! I know it’ll feel a little uncomfortable at first but guess what, just like your jeans, when stuffs uncomfortable it means that you are growing! The crux of the matter is that your brand is a massive player in your business BUT EQUALLY you need to be part of that brand too. You need to start to step into your brand and branding, you need to be part of your business and you need to start to explore your positioning in there so that you can shine. Taking your visuals and adding layers of personality and presence is the key.